Three premises were also convicted for selling tobacco related products to minors in the first three months of 2014. 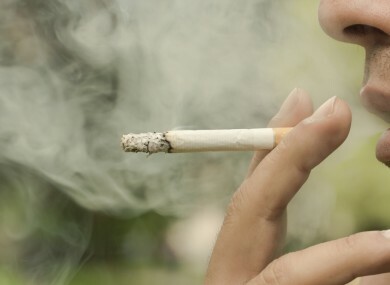 EIGHT BUSINESSES WERE convicted and fined after employees were found to be smoking illegally on their premises in the first three months of the year. The HSE published details of convictions for tobacco-related offences for the first time today. The figures show that 11 convictions took place from January – March, with three relating to selling cigarettes to minors. Seven of the incidents took place in Donegal, while the other four were in Wexford, Tipperary, Monaghan and Dublin. Dave Molloy of the HSE’s environmental health tobacco unit said that the incidents highlighted in today’s report indicate that “significant problems still remain in relation to smoking in the workplace, particularly in relation to licenced premises and non-compliant smoking shelters, and also in relation to sales of tobacco products to minors under the age of 18″. The report is part of the HSE’s Tobacco Control Framework implementation, which recommended that details of those convicted for offences under tobacco control legislation be made public. Section 47 of the Public Health (Tobacco) Act, which deals with smoking in the workplace, saw 251 prosecutions and 263 convictions from 2004 to the end of 2013. More than half of all prosecutions related to smoking areas in licensed premises such as pubs, night clubs and hotels. A number of owners and proprietors have been prosecuted and convicted on multiple occasions. All of the premises were fined and some were temporarily banned from selling cigarettes. HSE compliance checks on selling tobacco products to people under the age of 18 resulted in 43 prosecutions and 33 convictions between 2009 and 2013. “The HSE’s Environmental Health Service takes a compliance-building approach to our enforcement role, and where possible, we work with businesses so that non-compliance is often addressed without recourse to legal action. Prosecution is reserved for serious offences or where there has been deliberate and or persistent non-compliance,” Molloy added. Email “Eight businesses convicted after staff smoked on premises illegally”. Feedback on “Eight businesses convicted after staff smoked on premises illegally”.